Festival season might seem quite far off for those of us in the UK and Ireland, but looking at what people are wearing to Coachella can give us inspiration for our own summer wardrobes, and nod towards what the coolest festival fashion trends might be. Model Gigi Hadid’s outfit ticked all of the Instagram boxes: She was wearing oversized combat trousers, a crop top, lots of jewellery and a teeny-tiny Louis Vuitton bag. What really stood out though, was the Ganni tie-dye vest she wore. Vests are becoming increasingly popular – utilitarian chic never goes out of style – but the tie-dye pattern really takes it to the next level. Bucket hats have been slowly creeping into mainstream fashion and shedding their reputation for only being worn by stoners or those who haven’t washed their hair. This weekend its status as a certifiable trend was solidified by Katy Perry and Kylie Jenner. Bonus points to Jenner for pairing her Dior bucket hat with double denim and really leaning into the Nineties vibe. Sorry, this isn’t necessarily a new trend. In fact, we’re pretty sure tasselled clothes have overwhelmed Coachella every year – and yet it’s a look that seems to be going from strength to strength, so we really can’t ignore it. Celebrities like Shay Mitchell and Victoria Justice show anything can have tassels if you put your mind to it – whether it’s a crochet dress, a tiny crop top or a Western-style jacket. Miss Havisham might seem like a weird style icon for a Californian music festival, but fashion trends are often surprising. A lot of celebrities went full in on Victorian fashion – think billows of all-white, lots of ruffles and silky fabrics. Not a look to spill food on, but Selena Gomez looked amazing channelling it when she made a surprise appearance to perform with Cardi B. Considering it’s a festival in the desert, Coachella tends to operate on the ‘less is more’ principle – the fewer clothes the better. 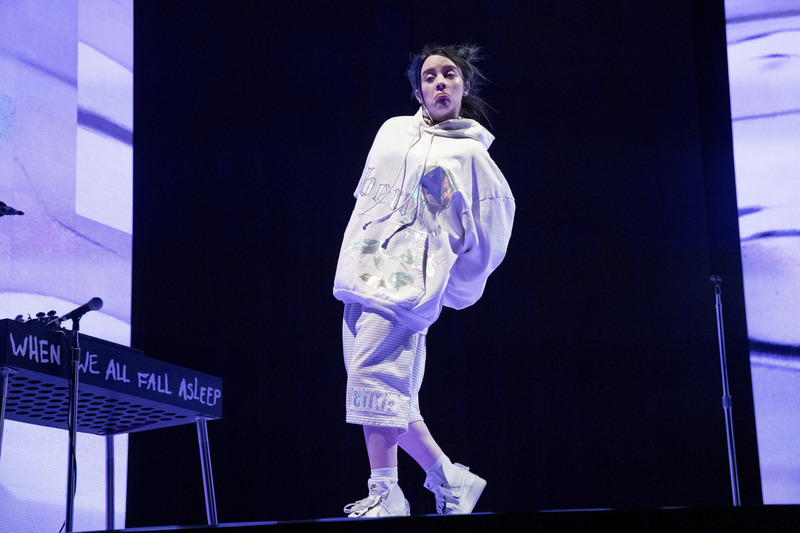 And yet there was a move towards baggy and oversized clothes, particularly exemplified by Billie Eilish’s hugely popular set. People either went for a fully baggy outfit – like Eilish – or mixed and matched with loose trousers and a tighter top, like singer Justine Skye. High-waisted short shorts are basically mandatory at Coachella, where you’ll see them on every second person. However, there was a new style of shorts seen this weekend – still high-waisted, but longer and skin tight. Models like Romee Strijd and Olivia Culpo were seen in them, but we’re not sure how great they’d look on everyone – they might be a bit too much of a Nineties throwback.